Why, apart from the coincidence of Paul VI’s October beatification by Pope Francis, might now be a moment apt for renewed attention to Humanae Vitae? Ignatius Press offers a timely response by way of an elegant and instructive new release. Ideal especially for any reader’s first foray into Humanae Vitae, the Ignatius offering complements its aesthetic elegance and simplicity with helpful historical information and contextualization. On Human Life (San Francisco, CA: Ignatius Press, 2014, 111 pages) surrounds Mark Calegari’s beautiful translation from the original Italian of the encyclical with the commentary of two Catholic scholars and a moving postscript by a Catholic writer. Mary Eberstadt prefaces the encyclical by noting the remarkable vindication that Humane Vitae’s prophetic pronouncements have enjoyed since the encyclical’s untimely 1968 promulgation in the midst of anti-authoritarian Western attitudes. While the teaching itself remains unpopular both within and without the Church, data analytical and anecdotal now confirms amply Paul VI’s fear that “the use of methods of artificial birth regulation” would entail “a general lowering of morality,” including man’s disregard for wife and government coercion of whatever forms of birth control it deems most fitting—a concern fresh in the minds of millions of Americans. Calegari’s translation delivers the encyclical in fidelity to the original Italian, and he helpfully footnotes—especially in section 16—important differences between the original text and the Vatican’s official Latin translation of it. One gets the sense reading the encyclical that if it weren’t known as (and titled) “On the Regulation of Birth,” its moving pastoral directives, cultural injunctions (to men of science, to priests, and so forth), and sensitive understanding and description of the married state might be more readily appreciated for their virtues, rather than dismissed as conciliatory efforts to cloak an inhumane message in the rhetoric of compassion. The entire encyclical and not its (in)famous central passages only is lucid, straightforward, and pastoral, although the “meat” of the encyclical clearly is ripe for further theological and philosophical development, as it indeed was developed by honorable scholars—whom James Hitchcock praises in his afterward—upon Humanae Vitae’s promulgation. 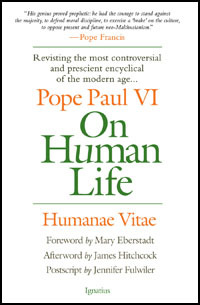 If Eberstadt offers a contemporary scan of Humanae Vitae’s vindication, Hitchcock provides the reader with a hermeneutic via which to parse the basic facts surrounding the encyclical’s release and reception within the Catholic world. He recounts how Pope John XXIII established the consultatory commission on questions of birth control and population in 1963; how Paul VI removed the subject from discussion at the Second Vatican Council and enlarged the commission to 58 members; and how the committee majority leaked its recommendation to the press prior to Humanae Vitae’s publication, further fanning popular hopes that the Church would alter course. Hitchcock also, as Eberdstadt does in the foreward, connects the year 1968 to the encyclical’s negative reception: “It was the peak year of a world-wide rebellion against authority that had been building up for half a decade,” and “the rejection of all sexual restraints was at the heart of this ‘counter culture,’” which Humanae Vitae directly challenged. Jenifer Fulwiler takes up the book’s analyses, papal and popular, into the moving story of a young parish priest’s decision to tackle contraception directly in a homily. The priest’s confrontation with the subject engendered an “electric silence” in the congregation as Fulwiler wondered how it would respond to such a frontal approach. The issue had been in the news, no doubt because of the divisive Hobby Lobby lawsuit. Would people walk out of the church? Refuse to speak to the priest after Mass? As Father Jonathan returned to his chair at the side of the altar, the question was suddenly answered. The pews erupted in spontaneous, thunderous applause. “Memory,” a theologian once said, “ifs always about the future.” This, I submit, is true of the memory of Humanae Vitae and the future of the Church and culture both. Whether one is approaching the encyclical for the first time after having heard much ado about it, or revisiting it after many years of allowing its memory to mature, On Human Life from Ignatius Press presents Paul VI’s teaching accessibly and informatively. Contraception isn’t a funny thing, and you won’t laugh while reading this book. Maybe, as Eberstadt muses, you’ll indulge a wry smile. To be sure, the sad irony of our cultural moment vis-à-vis this prophetic work of wisdom is less than subtle.